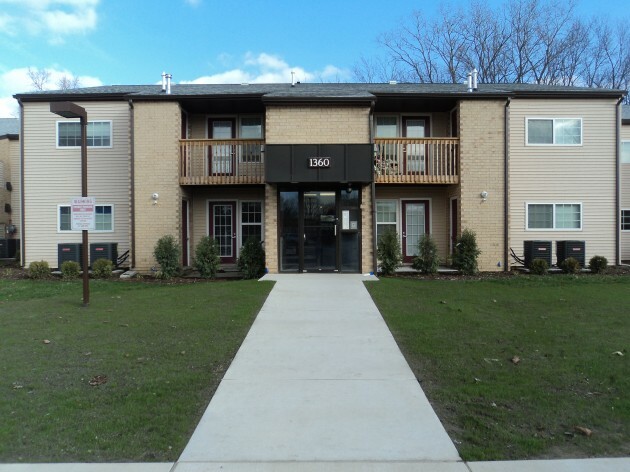 The 126 apartments that were renovated for this project were made possible by the Hometown Housing Partnership (HHP) of East Lansing. 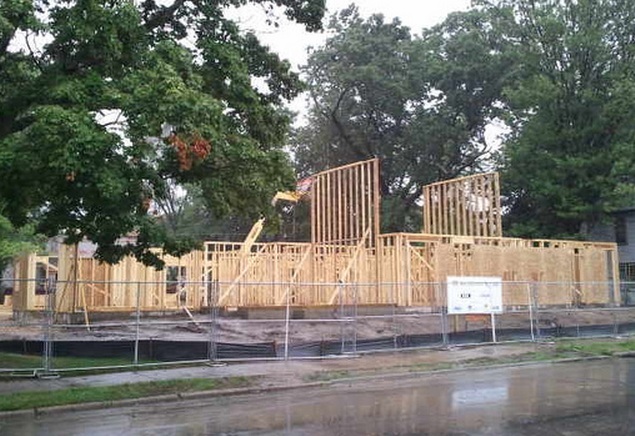 HHP is a nonprofit that has been providing access to affordable housing for over 20 years, and was formerly known as East Lansing Housing and Neighborhood services. In 2012 HHP became the managing general partner of 126 units of affordable housing at Deerpath Apartments and partnered with Hollander Development to complete renovate the townhomes. A large amount of materials were reused in rehabbing the home including: exterior framing and siding, foundation, cabinets, counters, roof framing, and the roof, floor, and 2/3 the wall sheathing. A 800 watt solar photovoltaic collector system is installed on top of the carports, which provides electricity for the lighting of the carports. All interior and exterior paints used are water based, low VOC, latex paints. Each apartment is outfitted with Energy Star certified appliances and energy efficient lighting. * correction – This is a new home and not a rehab. 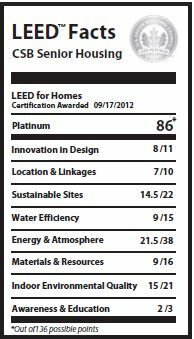 The approach was a LEED certified home that goes beyond most Habitat standards of just LEED silver and Energy Star Version 2. The goal was to get a house to achieve the coveted Energy Star V. 3 certification and Indoor AirPlus certification by achieving higher standards for the HVAC. The biggest hurdle for this house was installing a 95% efficient furnace coupled with an ERV mechanical ventilation system and flexible ducts in order to reduce energy costs and improve air quality throughout the 2-story house. The kitchen is outfitted with low VOC cabinets and a 100 CFM range hood which vents directly outside as opposed to in the attic or re-circulation. The Indoor airPlus certification contributed largely to the Energy Star V3 Certifcation, as the higher quality HVAC system also covered many of the prerequisites. The biggest hurdle for this home was to find a credentialed HVAC installer who would work with the higher standards required for Indoor airPlus. The water heater and furnace directly vent fumes outside and improve indoor air quality and efficiency of the equipment. The HVAC also has a MERV 10 rated filters and efficiently at 86 CFM, which fully circulates the air in the home approximately every 4 hours. The furnace itself runs on a single speed PSC motor which runs at set intervals and uses the ERV to moderate the temperature. The house also features a Superior Wall Foundation which contributes an R-Value of 5 to NuWool insulation installed on the walls for a total R-Value of 26. To further increase the insulation of the house the rim joists were also insulated and earn an efficient .3 U-factor windows were installed to reduce air leakage. The home appliances available in this house are Energy Star certified to accompany the Energy Star V3 certification on the house. Outfitted with low formaldehyde pressed wood materials in flooring and cabinets, as well as low VOC paints and finishes on the cabinets and walls. . Plumbing is outfitted using PEX piping as more flexible and reliable alternative to PVC or copper piping. 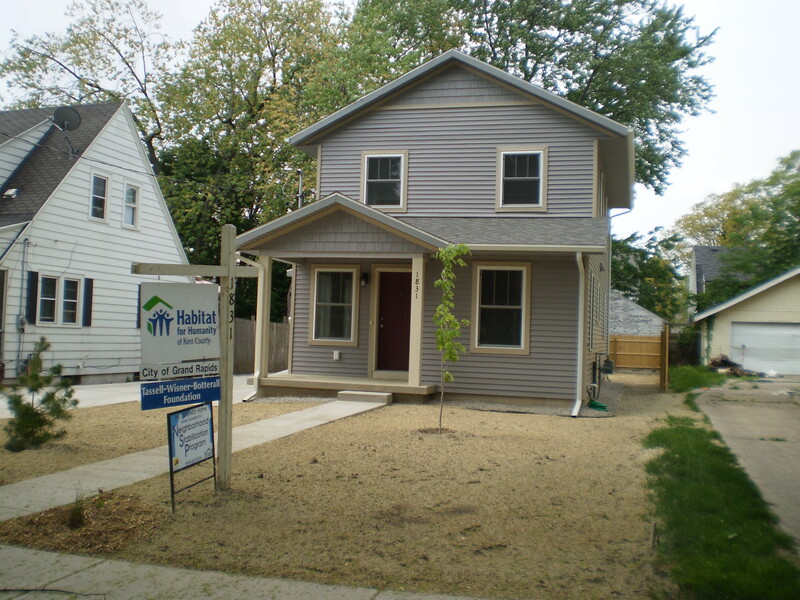 Habitat for Humanity Kent County is committed to 100% LEED Silver Construction and has saved homeowner’s $1,000 a year in utility costs as well as improved their indoor air quality compared to living situations they were previously in. 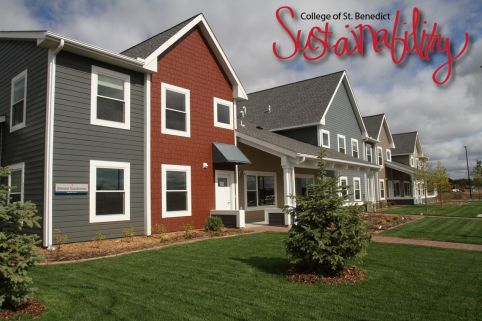 The Centennial Commons townhouses were designed to be a sustainable part of the colle ge’s landscape. The 32 townhouses were intended to be at least LEED Silver certified. The townhouse were originally considered in order to provide affordable housing for the 90% of students that live on campus, particularly the seniors. 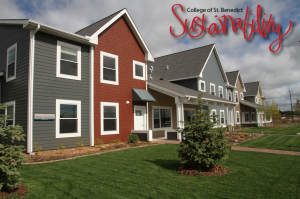 These townhouses were also built to represent the college’s commitment to sustainability, as well as the first college student housing in the state of Minnesota to have any LEED certification. Each townhouse has been outfitted with as many locally sourced materials, furniture, carpeting, and wood, as possible. The exterior is decorated with native plants and landscaping. Each townhouse is also individually metered for teaching students about their energy consumption and sustainability. The 2-story townhouses were designed for a durable 100-year life and to be as efficient as possible. The townhouses provide housing for 125 students, accommodating 3-4 students in 4 bedrooms, with 2 full bathrooms. Each townhouse also has two bathrooms, laundry room, living room, kitchen and front porch. Also included in this project was the Commons Building to provide the community with a gathering space, study rooms, computer lab, kitchen and a multi-purpose room. The townhouses are clustered for a compact development within half a mile of community resources; churches, libraries, convenience stores, fitness centers and shops. The building site was selected as it was not a habitat for endangered or threatened species, a wetland or public parkland. The townhouses also utilize outdoor LED lighting, non-toxic pest control and low flow plumbing inside. During construction 37% of waste was diverted, documented, and recycled while erosion control was also put into action in designing and installing the landscape. 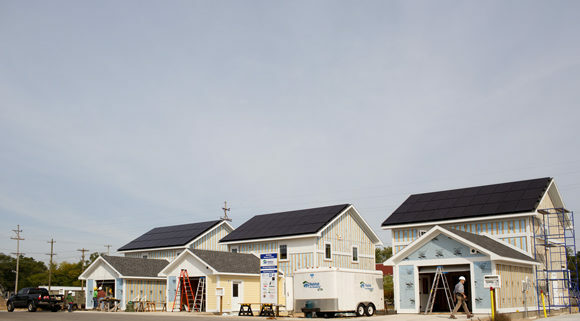 GRAND RAPIDS, MI – With all the interest in “green jobs” training from colleges and universities you might be surprised to learn that a cohort of emerging green design and construction professionals are being trained all over the US on Habitat Projects. 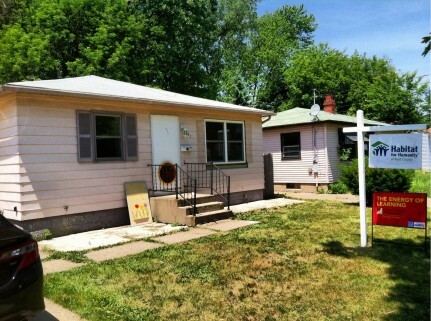 AT 426 Adams SE in the City of Grand Rapids. 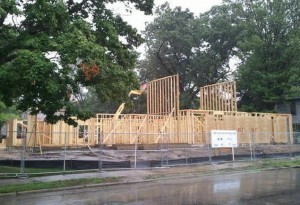 426 Adams SE is a construction site for a new home being built via Habitat for Humanity of Kent County. The reason the cohort is there is Habitat Kent’s commitment to building 100% Leadership in Energy and Environmental Design (LEED) certified homes. 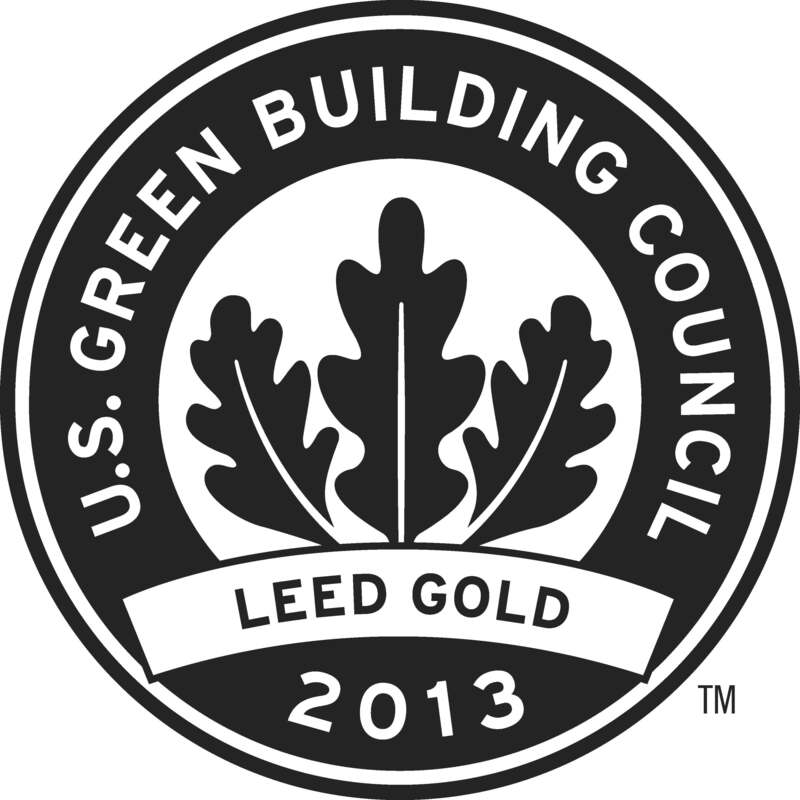 Since 2007 that commitment has led to 100 LEED projects. 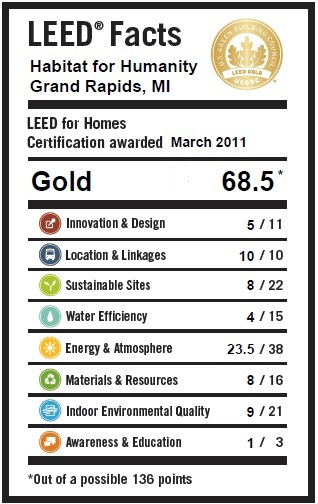 LEED certification starts on projects as small as a single-family residential home, all the way up to an awe-inspiring skyscraper or sports stadium. And with more municipalities requiring LEED and an increase of consumer demand for green, LEED Professional Accreditation is an essential credential for today’s building industry professional. 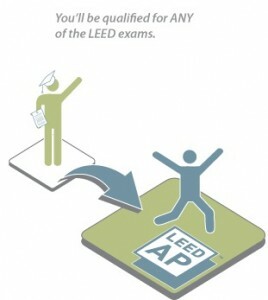 However, the road to LEED Professional Accreditation is not easy – as extensive LEED project experience is now a prerequisite for professionals to qualify for the LEED exams. This requirement creates a near-impossible barrier for recent graduates, unemployed, and those changing careers: how does one gain LEED experience, if LEED experience is required for employment? But Habitat for Humanity of Kent County has a solution: an entry-level, hands-on LEED project experience program called EverbuildPRO. This program is possible through Habitat’s partnership with BOULD, a Colorado-based social enterprise that grew out of the Boulder, CO Habitat affiliate, who sought to help LEED-seeking professionals and students gain green experience through Habitat home construction. EverbuildPRO is a hands-on experiential education program – that provides professionals and students with the hand-on, real world experiences necessary to launch green careers. The program consists of 50 hours of experience on a 4-month building project – where participants will get access to: participation in design and planning meetings, tackling of green research and documentation, witnessing performance inspections, and even rolling-up their sleeves and building on-site! Upon program completion, participants will graduate with multifaceted green experience, a LEED-certified building to add to their resume, and qualification for LEED Accreditation, the world’s most recognized sustainability credential. Interested individuals can find registration information for the upcoming project at www.habitatkent.org/green under “LEED AP Project Experience”. Anyone can Habitat or Individual can participate in their local area across the country too. The nonprofit Christian housing organization Habitat for Humanity of Kent County seeks to serve God, build hope and transform lives through neighborhood revitalization and homeownership for families who otherwise could not afford a home of their own. Since 1983, Habitat Kent has served more than 320 families by welcoming people of all races, religions and nationalities to construct, rehabilitate or preserve homes; by advocating for fair and just housing policies; and by providing training and access to resources to help families improve their shelter conditions. For more information, to donate, volunteer, or purchase a home, please visit www.habitatkent.org, or follow us atwww.facebook.com/habitatkent or at www.twitter.com/KentCoHabitat. Nine new LEED for Homes registered townhomes in Southeast Grand Rapids are under construction as the first leg of a much larger proposed project by LINC Community Revitalization, Inc. to replace abandoned foreclosed homes with modern, energy efficient townhomes. 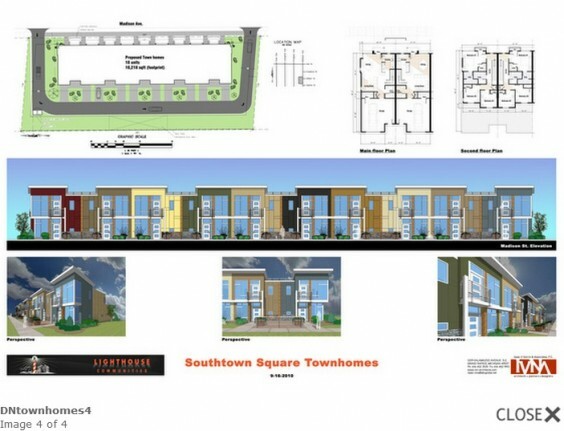 The project, Southtown Square, demolished two dilapidated townhouses and a vacant commercial printing business and remediated contaminated soil. Now, nine affordable-rate townhomes are heading for completion, part of a project that could replace some 20 foreclosed properties with 41 modern homes in a neighborhood where many families have struggled to keep their homes, and lost. The nine two-story townhomes (537 and 539 Hall St. SE; 454 and 456 Umatilla St. SE; 429, 431 and 433 Umatilla St. SE; and 428 and 430 Woodlawn St. SE) will run 800 to 1,150 square feet. Most offer three bedrooms and two-and-a-half baths, says Stephanie Gingeritch, LINC real estate development director. All of them will have full appliance packages and in-home laundry. One home will have a handicap accessible main floor bathroom and bedroom. LINC purchased the properties from the Michigan Land Bank, Gingeritch says. Work on another two-building townhouse project near Hall and Madison Avenue SE begins in September. “This is part of a larger redevelopment project where we will be purchasing additional foreclosed townhouses from the State of Michigan and redeveloping those as affordable units,” Gingeritch says. “We recently submitted an application for tax credit financing for an additional 41 units of housing (five additional sites, 20 buildings) on Umatilla and Gilbert. We’ll hear in March 2013 if that is awarded. “We’re glad we can bring this quality development to the neighborhood where there are already families who are established and don’t have to move out of the neighborhood to have this,” Gingeritch says. The project is part of the Neighborhood Stabilization Program 2 to stabilize neighborhoods damaged by the economic effects of properties that have been foreclosed upon and abandoned. Architect: Isaac V. Norris & Associates, P.C. Construction: Orion II Construction Inc. 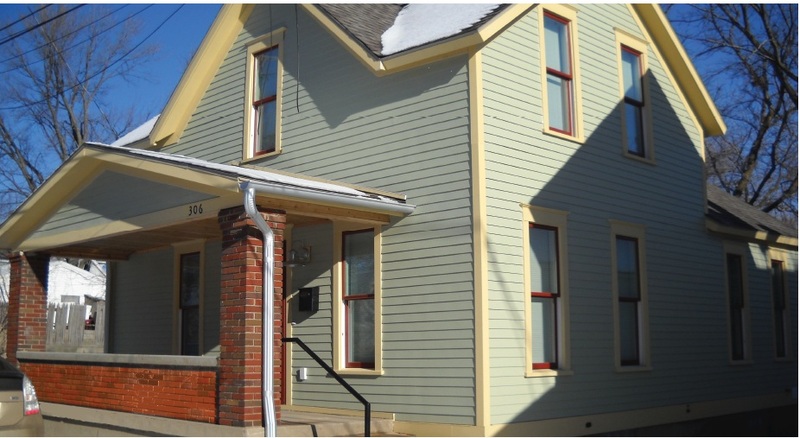 Source: Stephanie Gingeritch, LINC Community Revitalization, Inc.
After dozens of new and gut-rehab LEED projects, the Grand Rapids, Michigan Habitat for Humanity affiliate is ready to begin a new era. That happens to be a really old era too. With LEED for Homes-registered project #100, Habitat for Humanity of Kent County will start work on their ambitious “Wealthy Heights” neighborhood effort to rebuild homes built in the 1880’s as affordable, workforce housing. 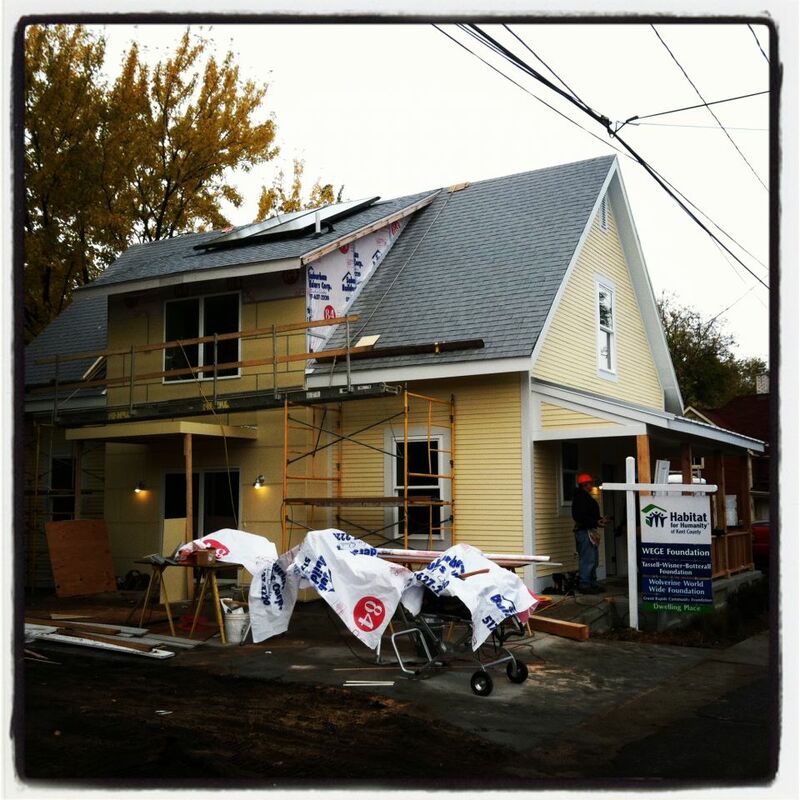 After building one new LEED platinum home (Grand Rapid’s 1st!) 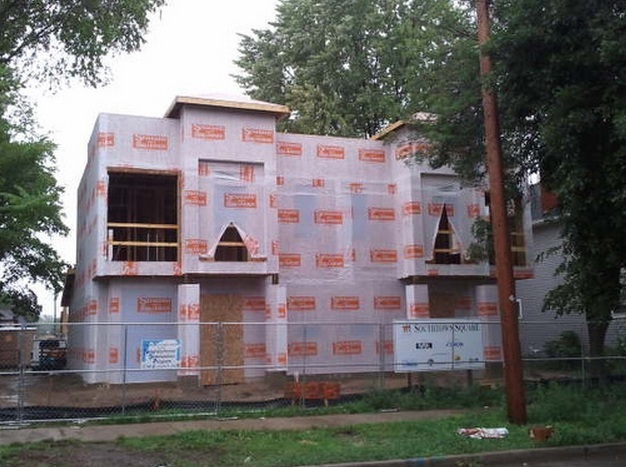 and preserving a single-family home and a two-unit in Wealthy Heights over the last couple years, Habitat is ready to start seven more projects this fall. It will also coincide with major road and infrastructure improvements by the City of Grand Rapids. Neighbors in Wealthy Heights get ready for construction season! “The neighbors and business owners who have led the revitalization effort in this neighborhood over the last three decades made it possible for Habitat to step into the mix. Being historic has been a challenge and a blessing but now become a really desirable location for our home buyer partner families,” said Habitat’s Chris Hall. Since then, Habitat has completed the three home projects but also built a community garden and hosted an AmeriCorps Signature Service Project which offered basic exterior repairs, landscaping and a fresh coat of paint for home owners on Donald Place SE. 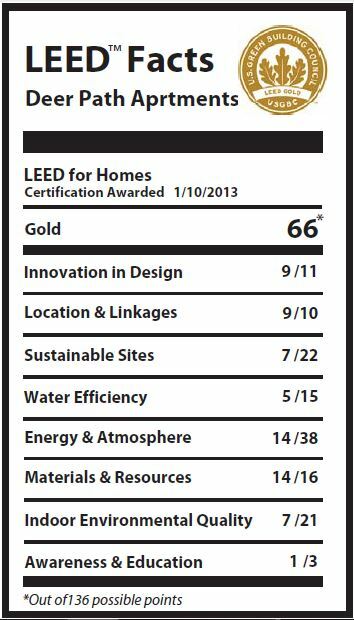 After committing to 100% LEED for Homes certification in 2007, Habitat Kent has gone one to become recognized internationally as a leader in affordable, sustainable design and construction. 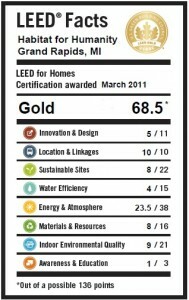 In fact, they were awarded for “Outstanding Program Commitment” to LEED for Homes at the 2011 Greenbuild Conference and Expo in Toronto. Future posts will feature a profile of the 100th registered home at 327 Freyling Place SE as well as the other upcoming and completed projects. Research is being done by MSU and FSU students and faculty with support from Dow and Habitat. They begin with the lowest cost and simplest forms of energy efficiency including cans of spray foam at joints and in gaps, spray foam in rim joists, and other air sealing measures. From there they will test other wall insulation and mechanical system combinations. At each step the homes are tested and analyzed. LEED for Homes OUTSTANDING PROGRAM COMMITMENT Winner. The spotlight project for their award was a 110-year-old single-family home in the historic Wealthy Heights neighborhood in southeast Grand Rapids. This home represents a beautiful example of affordable, sustainable, historic preservation. Along with the typical Habitat for Humanity volunteer labor force, a core team of four recent graduates of the Grand Rapids Public Schools Academy of Design & Construction assisted from start to finish. These young people learned how to rehab an historic home in the context of a challenging LEED for Homes project which achieved LEED Gold. 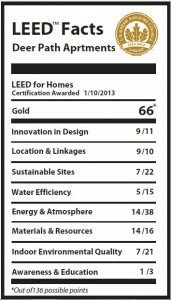 The 53 HERS score for this home was, at the time, the most energy efficient home built by Habitat Kent. This is noteworthy since the home is over a century old and was originally built to “breathe” so achieving such air-tightness wasn’t easy. This success is even more impressive considering the untrained, inexperienced labor-force of volunteers who rehabbed the home. Simply being located in a historic district also invited numerous challenges including using wood windows (which are notoriously inefficient). Despite these challenges, the project team hit a home run with this home. Their recent dedication to be restorative to the Wealthy Heights Community has lead to several projects that involved painting, remodeling, gut rehabbing, as well as building several new homes and creating community gardens. Habitat is completely revitalizing the area. Their highest achievement here is their commitment to constructing a net zero or near zero (currently) 5 bedroom home. This home features, ICF and SIP panel construction and has a solar hot water heater attached to the house. The homes HERS score tested out to be 35, one of the lowest in Michigan. They are still missing the Solar PV making a perfect promotion opportunity for any company willing to supply solar to this project. Please contact Chris Hall if you are interested. CJHall@habitatkent.org. Due to Habitat for Humanity of Kent Countie’s commitment to LEED certification, they have been able to attract many more sponsors, donors and volunteers. They have also been able to achieve some great accomplishments. Deconstruction of homes literally saves tons of usable materials and items from heading to the landfill. These materials are re-sold at the Habitat ReStore for a profit to build other homes. Habitat discovered that it costs approximately $8000 more to incorporate green building and zero-step entry into a Habitat home building per house, and that the long-term benefits to the family and the environment easily justify the expense. It is estimated (based on their earliest LEED Homes) that annual savings costs for electric, water, and heating will be at least $1,000 per home per year. The extra money available every month eases the hard decision “food or heat?” for families who live close to the poverty line. Over the life of each homebuyer’s 25 year mortgage, the savings equates to $25,000 at minimum – money a family is able to invest into strengthening their future.Looking to start a LEED for Homes or a Green Building project within your Habitat Affiliate? Please contact today. 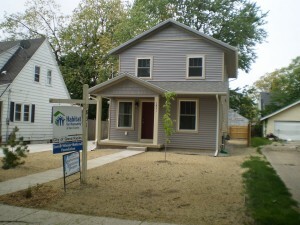 We work with over 20 other Habitat Affiliates including Detroit, Chicago, Cincinnati and Indianapolis. 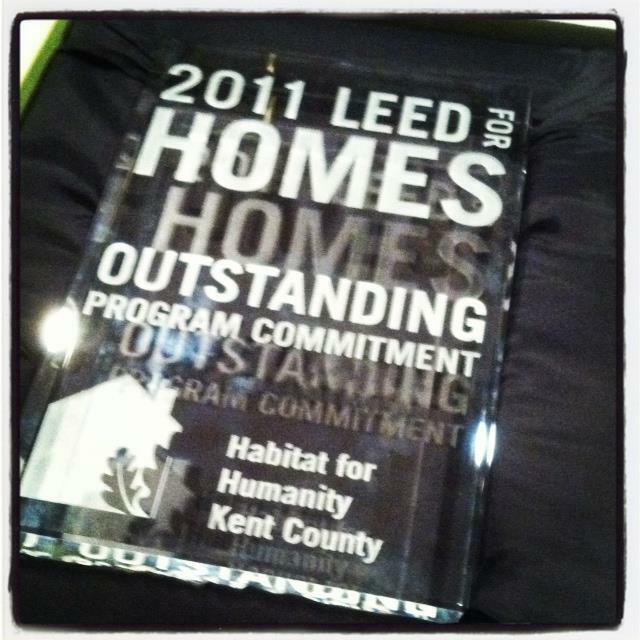 https://greenhomeinstitute.org/wp-content/uploads/2011/11/Habitat-for-Humanity-Kent-County-won-the-2011-Green-Build-outstanding-program-commitment-to-LEED-for-Homes1.jpg 640 640 Brett Little https://greenhomeinstitute.org/wp-content/uploads/2018/08/GHI_Round-300x82.png Brett Little2011-11-16 13:13:182016-09-02 17:11:50LEED for Homes OUTSTANDING PROGRAM COMMITMENT Winner. Join USGBC for a free 3-part webinar series exploring the green affordable housing movement. – Examine market examples to discover factors driving green affordable housing, as well strategies for success and the benefits to going green when tackling affordable housing projects. – Explore the synergies between keeping design and construction costs down and building in a responsible, sustainable fashion. – Identify tools and strategies to finance retrofits of existing multifamily developments while taking an in-depth look at affordable housing and LEED. All sessions will be held from 1:00 to 2:30 PM EDT. Each session in this series will be registered for 1.5 hours of continuing education with AIA/CES SD/HSW, and GBCI CMP hours for LEED professionals.